Your entire staff from the staff who answered the phone, Charles our bus driver, the girls at reception, Conor and especially Braden our guide, were outstanding! Adventurers looking for the most ‘extreme’ Kumsheen experience will love this trip. 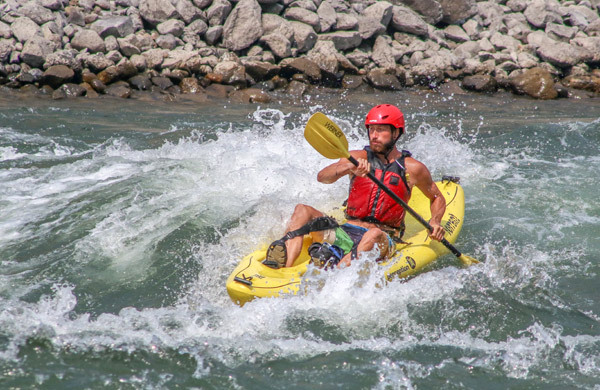 We teach you the basics, and lead you into the big whitewater! Our day starts by learning the ropes in Kumsheen’s onsite pool. Meet your guide & fellow thrill-seekers, learn how to paddle & to self-rescue, and then it’s time for the river! Once at the river, it’s time for a little more training. We practice the same skills you learned in our pool, as well as many river specific techniques. Learn quickly, because the first rapid is just downstream! We have picked the perfect section of the Thompson River for this trip – from Martel to Nicomen Falls. This 30km stretch offers a combination of swirling ‘eddy’ lines, towering waves, and relaxing calms. Join us on one of the most unique whitewater adventures in BC! **You must be a very competent swimmer, have no fear of water, and be in a good physical condition in order to participate in this tour.